Every bride wants her wedding to be unique and beautiful; and planning for it can be quite draining and stressful. The trends for weddings are taking a new turn every year, and with the thousands of choices out there, along with different opinions and advice from parents and relatives, it’s easy to become overwhelmed. Be the well-meaning friend and try to help out in your own little way. Here are some gift suggestions to ensure that the bride and groom have a great start to the rest of their lives. Magazines are good sources of information for upcoming trends and inspiration, among other helpful tips. A magazine subscription is something that the couple will surely appreciate. A. Martha Stewart Weddings– Who isn’t a fan of Martha Stewart? Her magazine is sure full of fabulous and practical ideas. 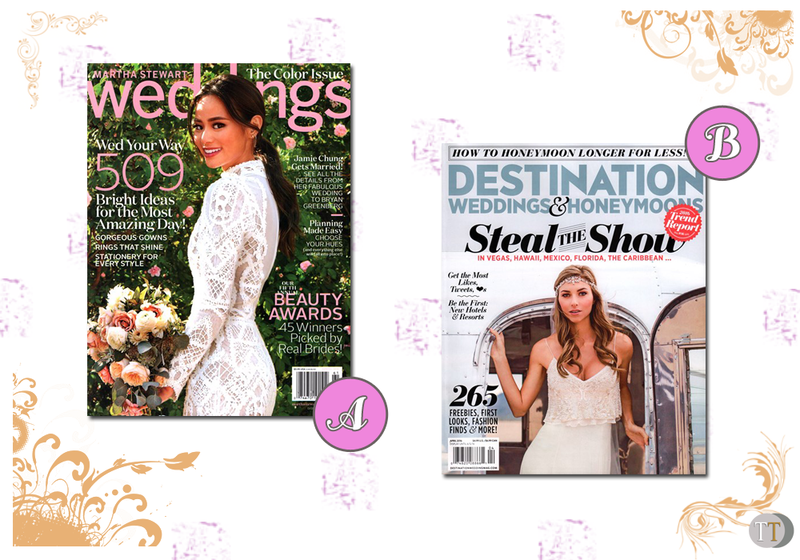 B. Destination Weddings & Honeymoons– This magazine will definitely help the couple decide if they are planning to have an out of town wedding. Honeymoon destinations are tackled in this magazine also. Couples nowadays are opting for more laidback and non-traditional weddings. 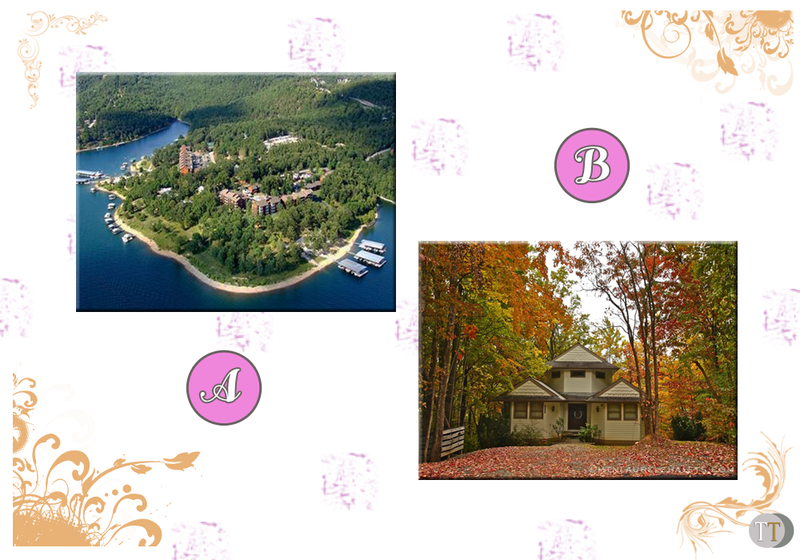 So garden, beach, museums, restaurants or even a wedding up in the mountains are among the popular choices. Here are two example venues you can suggest or maybe organize. A. Stillwaters Resort– Located in Branson Missouri, this resort sits on the banks of Table Rock Lake. There are several activities that the couple can try like kayaking, biking and fishing. B. Alpine Getaway– This cabin is located in the woods. A perfect destination for the couple who likes nature. The reception is also a very important part of every wedding. You can help the couple brighten up their reception with these embellishments. A. Antiqued Battenburg Lace Parasol– In line with outdoor ceremonies, these chic and elegant pieces are a sure hit. B. Sunglasses with Personalized Labels– This cute item is definitely unique giveaway. C. Personalized Chalkboard Backdrop– This is the backdrop guests will clamour to choose. With the black and white colors, it will complement what every guest is wearing. Adding a personalized message such as the date and the couple’s names will help the guests make a memory that will last for a lifetime. D. Kissing Booth Backdrop– Include a kissing booth personalized photo backdrop and let the guests have fun with it. It’ll surely be a night of love and smooches! 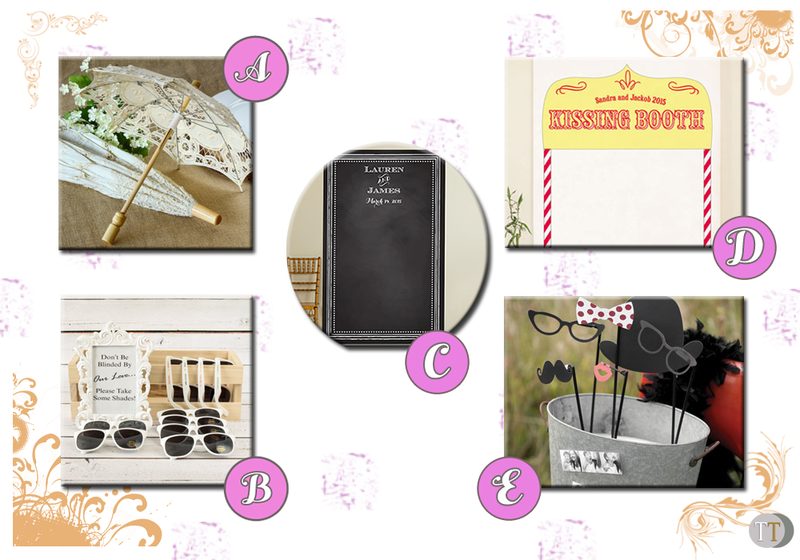 E. Photo Prop Set– Throw in some photo props so guests can take silly pictures as they pose with a mustache or cat-eye glasses. 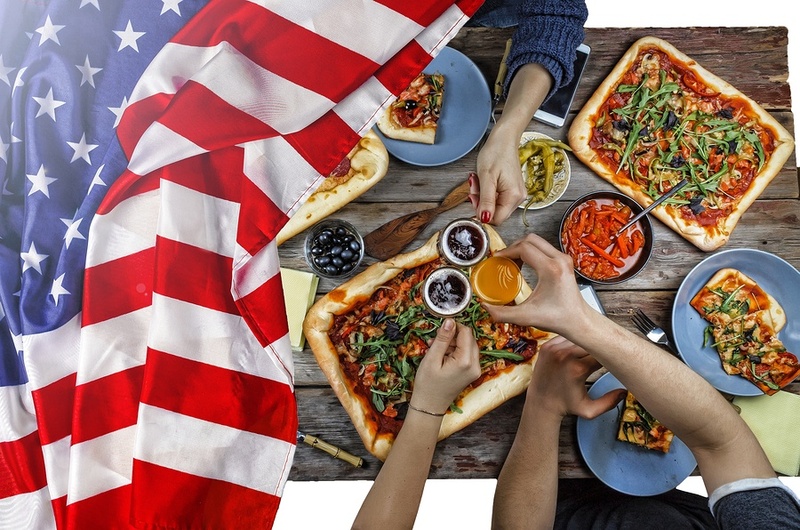 Everyone loves food, so couples are now going for parting gifts that the guests can munch on. The wedding will definitely be a beautiful and delicious memory! Below are some of the winner take-home sweets. A. Custom Macaroons– Let your guests have a taste of a Parisian adventure with this delectable macaroon. B. 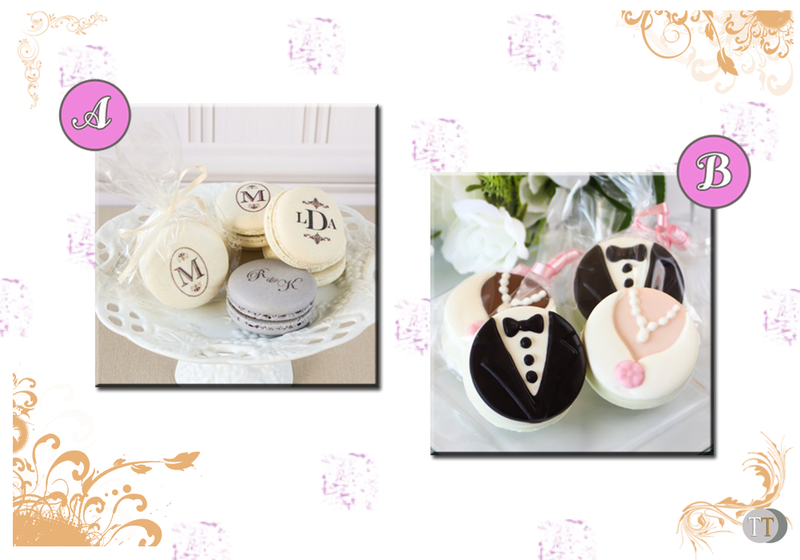 Bride & Groom Oreo Cookies– Cute oreo cookies covered in chocolate that will surely give a sugary delight to visitors. 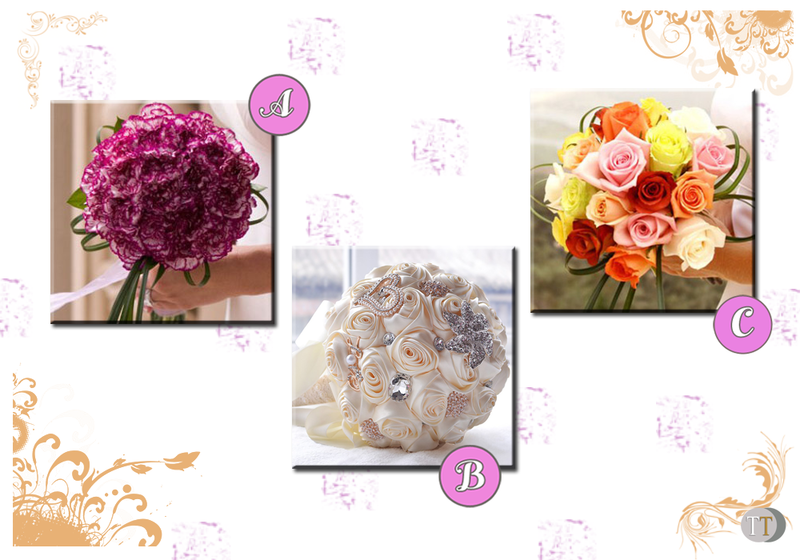 Even choosing bouquets can be exhausting for the bride. Why not give her a brooch bouquet that you can make yourself, or you can have fresh beautiful flowers delivered. Let these three items below help you decide. A. Bridal Bouquet with Purple Carnations– If you want to have a pop of color in your bouquet, this is the perfect pick. B. Crystal Brooch Wedding Bouquet– A kind of bouquet that will last for a long time. This can be your memorabilia from your special day. There are a lot of new wedding trends every year, but it doesn’t mean that one should conform to the norm. So choose gifts that you think will suit the couple’s personality and they’ll surely love you for it! Follow Teelie Turner’s board Wedding Favors on Pinterest.